Summer is an ideal time to bring out your highlights on a daily basis. Unfortunately, during the autumn-winter season, there is a risk that your hair will lose its healthy shine. The reason for this? The weather, fatigue and stress. Thankfully, there are several ways to restore brightness to your highlights. Here is our advice from the pros. The first solution will cost you nothing and is easy to do everyday! "Beautiful highlights are maintained by a scalp massage. Having the right hand tricks can save you from a glooming colour! Massage your scalp by peeling the hairs to soften it, allowing it to breathe. Done daily, this gesture will give you more vibrant hair. Try to do this gesture when shampooing but also whenever you can. Finally a good excuse to ask your darling to give you a daily massage!" Getting the appropriate products for your hair type is the second stage to boosting your hair! "This solution is particularly relevant to blondes and redheads whose hair shine depends on its highlights. Blondes should opt for chamomile based care while redheads will prefer henna based care. Brunettes are lucky and don't have to depend on highlights to display unquestionable brightness. They only need shampoos and treatments tailored to their hair type." Vibrant highlights necessitate a beautiful colour. Without opting for a permanent colour, you can try our Gloss treatment from Jean Louis David salons. "This is a temporary colour that enhances your highlights and adds daily shine. This colour fades after several shampoos, allowing you to avoid a drastic change of colour." Our tips: You have coloured hair and it lacks radiance? Remember to use care for coloured hair. Sometimes all you need is a shampoo to revive your highlights. 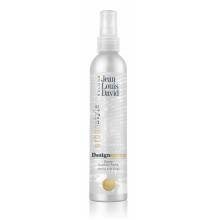 In the Jean Louis David line, the Color Therapy products are ideal to boost and brighten your hair. Which hair routine for my Contrast highlights?